"CbCr" redirects here. For other uses, see CBCR. A color image and its Y, CB and CR components. The Y image is essentially a greyscale copy of the main image. Cathode ray tube displays are driven by red, green, and blue voltage signals, but these RGB signals are not efficient as a representation for storage and transmission, since they have a lot of redundancy. YCbCr and Y′CbCr are a practical approximation to color processing and perceptual uniformity, where the primary colors corresponding roughly to red, green and blue are processed into perceptually meaningful information. By doing this, subsequent image/video processing, transmission and storage can do operations and introduce errors in perceptually meaningful ways. Y′CbCr is used to separate out a luma signal (Y′) that can be stored with high resolution or transmitted at high bandwidth, and two chroma components (CB and CR) that can be bandwidth-reduced, subsampled, compressed, or otherwise treated separately for improved system efficiency. One practical example would be decreasing the bandwidth or resolution allocated to "color" compared to "black and white", since humans are more sensitive to the black-and-white information (see image example to the right). This is called chroma subsampling. YCbCr is sometimes abbreviated to YCC. Y′CbCr is often called YPbPr when used for analog component video, although the term Y′CbCr is commonly used for both systems, with or without the prime. 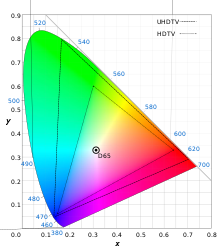 Y′CbCr is often confused with the YUV color space, and typically the terms YCbCr and YUV are used interchangeably, leading to some confusion. The main difference is that YUV is analog and YCbCr is digital. Here, the prime ′ symbols mean gamma correction is being used; thus R′, G′ and B′ nominally range from 0 to 1, with 0 representing the minimum intensity (e.g., for display of the color black) and 1 the maximum (e.g., for display of the color white). The resulting luma (Y) value will then have a nominal range from 0 to 1, and the chroma (PB and PR) values will have a nominal range from -0.5 to +0.5. The reverse conversion process can be readily derived by inverting the above equations. When representing the signals in digital form, the results are scaled and rounded, and offsets are typically added. For example, the scaling and offset applied to the Y′ component per specification (e.g. MPEG-2) results in the value of 16 for black and the value of 235 for white when using an 8-bit representation. The standard has 8-bit digitized versions of CB and CR scaled to a different range of 16 to 240. Consequently, rescaling by the fraction (235-16)/(240-16) = 219/224 is sometimes required when doing color matrixing or processing in YCbCr space, resulting in quantization distortions when the subsequent processing is not performed using higher bit depths. The scaling that results in the use of a smaller range of digital values than what might appear to be desirable for representation of the nominal range of the input data allows for some "overshoot" and "undershoot" during processing without necessitating undesirable clipping. This "head-room" and "toe-room" can also be used for extension of the nominal color gamut, as specified by xvYCC. The value 235 accommodates a maximum black-to-white overshoot of 255 - 235 = 20, or 20 / ( 235 - 16 ) = 9.1%, which is slightly larger than the theoretical maximum overshoot (Gibbs' Phenomenon) of about 8.9% of the maximum step. The toe-room is smaller, allowing only 16 / 219 = 7.3% overshoot, which is less than the theoretical maximum overshoot of 8.9%. Since the equations defining YCbCr are formed in a way that rotates the entire nominal RGB color cube and scales it to fit within a (larger) YCbCr color cube, there are some points within the YCbCr color cube that cannot be represented in the corresponding RGB domain (at least not within the nominal RGB range). This causes some difficulty in determining how to correctly interpret and display some YCbCr signals. These out-of-range YCbCr values are used by xvYCC to encode colors outside the BT.709 gamut. From the above constants and formulas, the following can be derived for ITU-R BT.601. The resultant signals range from 16 to 235 for Y′ (Cb and Cr range from 16 to 240); the values from 0 to 15 are called footroom, while the values from 236 to 255 are called headroom.
. This allows for the value 256 in the denominator, which can be calculated by a single bitshift. needs to be included in the equations. This form of Y′CbCr is used primarily for older standard-definition television systems, as it uses an RGB model that fits the phosphor emission characteristics of older CRTs. This form of Y′CbCr is based on an RGB model that more closely fits the phosphor emission characteristics of newer CRTs and other modern display equipment. The definitions of the R', G', and B' signals also differ between BT.709 and BT.601, and differ within BT.601 depending on the type of TV system in use (625-line as in PAL and SECAM or 525-line as in NTSC), and differ further in other specifications. In different designs there are differences in the definitions of the R, G, and B chromaticity coordinates, the reference white point, the supported gamut range, the exact gamma pre-compensation functions for deriving R', G' and B' from R, G, and B, and in the scaling and offsets to be applied during conversion from R'G'B' to Y′CbCr. So proper conversion of Y′CbCr from one form to the other is not just a matter of inverting one matrix and applying the other. In fact, when Y′CbCr is designed ideally, the values of KB and KR are derived from the precise specification of the RGB color primary signals, so that the luma (Y′) signal corresponds as closely as possible to a gamma-adjusted measurement of luminance (typically based on the CIE 1931 measurements of the response of the human visual system to color stimuli). JFIF usage of JPEG supports Y′CbCr where Y′, CB and CR have the full 8-bit range of [0...255]. Below are the conversion equations expressed to six decimal digits of precision. (For ideal equations, see ITU-T T.871.) Note that for the following formulae, the range of each input (R,G,B) is also the full 8-bit range of [0...255]. ^ Charles Poynton, Digital Video and HDTV, Chapter 24, pp. 291–292, Morgan Kaufmann, 2003. ^ a b "BT.2020 : Parameter values for ultra-high definition television systems for production and international programme exchange". International Telecommunication Union. June 2014. Retrieved 2014-09-08. ^ T.871: Information technology – Digital compression and coding of continuous-tone still images: JPEG File Interchange Format (JFIF). ITU-T. September 11, 2012. Retrieved 2016-07-25. YUV, YCbCr, YPbPr color spaces.